Latent within everyone who has a sentient conscious mind there is an “invisible” partner who has the answer to literally everything. This invisible partner is also referred to as the subconscious mind and the channel through which it will supply you with the answers and solutions you seek is known as intuition. Intuitive solutions to problems and the inspiration behind creative, life-changing ideas are derived from the subconscious through a combination of or balance between focus and relaxation. The world’s greatest artists, writers, musicians and so on – in fact anyone who is genuinely successful in what they do – do not come up with their ideas and insights through simply a process of practice and logical deduction, but rather through moments or flashes of inspiration which are accompanied by strong intuitive feelings of “yes, that’s it!” or “yes, this is the answer!” where the person who is able to tap into and listen to their intuition about something is filled with an exciting and emotional sense of rightness, a “Eureka” moment which is in no way delusional or narrow minded but instead brings with it that indefinable feeling of having truly found the right answer or solution. We all know of or have heard about people who seem to have a predisposition for often being in the right place at the right time in circumstances that benefit them. There may be some element of chance in this, but that’s definitely not the underlying factor which makes it happen for them with any degree of consistency. What makes it happen is that these people – whether they consciously know it or not – are able to listen in to their intuitive faculty and thereby make the right judgements and decisions about what to do and when and how to do it. Phrases like “blue sky thinking” or “thinking outside of the box” are linguistic attempts to convey the significance and importance of intuition in decision making and idea seeking. People who often seem to be able to come up with the right moves or ideas have developed – consciously or unconsciously – the ability to “think outside of the box”, in other words to tap into and listen to their intuition about something they’re focused on. 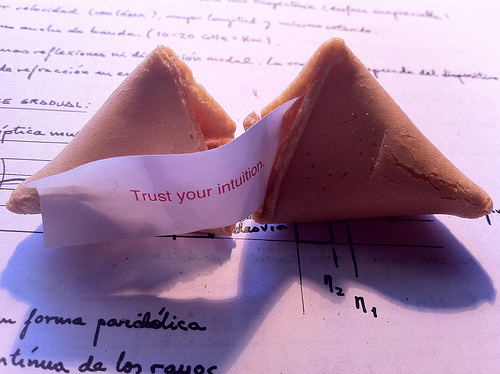 Intuition can supply you with the answer or solution to any important question or problem that you may have, and can show you the easiest and quickest way to get from desire for the achievement of a goal to the actual achievement of it. The first step is to understand and accept that you have within you a wise and powerful partner – your subconscious mind – and that it can show you the way to the fulfillment of your desire and can supply you with the knowledge and information that you need to make it happen. Make a concerted and consistent mental effort to open yourself up to the reality of the power of your subconscious mind so that you go beyond a mere philosophical or intellectual concept of it toward a more emotional understanding and acceptance of it. When you reach this point a sense of excitement and motivation will begin to well up within you as you begin to appreciate the true possibilities and potential of your life, whatever your life may currently seem to be like. Then just relax and allow yourself to accept that the solution will soon emerge, or if it’s bedtime drop off to sleep and let the subconscious work on unhindered. You should also supplement this approach by going out of your way to acquire as much information as you can on whatever subject, question or problem it is that you’re seeking an answer or solution to. Absorb as much as you can about it, but without worrying about actually finding your solution just yet. What you’re trying to do here is to mentally absorb a wide range of information so that different aspects of the subject start to play themselves off against each other in interesting and hitherto unthought of ways. On the conscious level you may end up feeling somewhat confused, but on the subconscious level inspired answers and solutions are starting to form and will soon come to the fore. After you’ve spent some time on this, say over a period of a few days or evenings, simply allow all the information to settle down into your mind. Don’t be anxious or impatient about any lack of immediate answers, just be assured that in its own time your subconscious will come up with what you’re looking for. This moment often comes when you’re quite relaxed and not actually thinking about your question or problem. Something just suddenly and apparently out of the blue comes to the fore and you realize that you’ve got it, and you know that you’ve got it. Your wise and powerful inner partner has done its work and brought to you what you desired. The best way to approach all this is to a) consistently reach toward an emotional understanding and acceptance of the power of your subconscious mind, b) spend some days or evenings absorbing information about your question or problem and c) on a daily or preferably nightly basis use the previously mentioned affirmation or something similar around 20 times. Whether you’re for example seeking to find a soul-mate, or are considering the pros and cons of making a career move, or simply trying to find some direction and purpose in life or anything else, you already intuitively know what the answer is, it’s just a matter of drawing it out and putting it into practice. Kenneth McRae has for some time been an avid student of hypnosis and psychology and to date has written many articles on these subjects. To learn more about building confidence and self esteem, losing weight, quitting smoking, dealing with phobias and much more, visit www.self-hypnosis-the-key.com.